We never really own a property, especially an old one. We are just the latest custodians in a long line of influencers and makers able put our mark on a house, flat or farm. The Old Farmhouse is now listed on AirBnB, please get in touch with us if any dates are not listed. In the UK we have a lot of valuable history archives available including photography, old mapping and census details. From these we know the buildings here have undergone continual evolution as the needs of the land and community have changed. 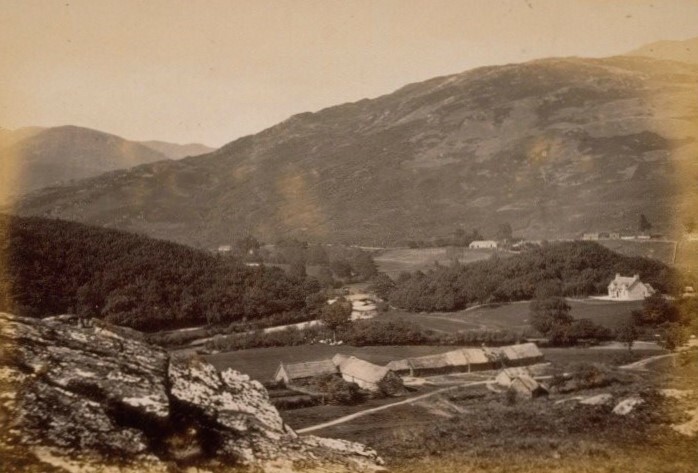 Our oldest photographic record doesn’t even show the current “Old Farmhouse” dated late 1800s. Of course the most immediate story is that of the past residents and locals. In living memory the farm was managed without a running water supply. Electricity came in the 1970s and mains water only in the late 1990s. We still don’t have hardwired broadband of course! 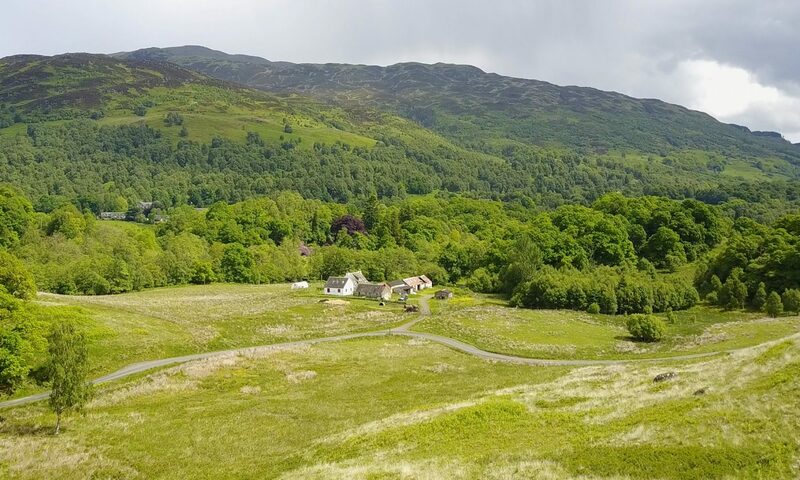 Images below show the layout before the farmhouse was established (taken from South at Creag Dubh) and from the North West field (before the late C20 extension). With planning consent granted in February 2018 work began on the Farmhouse, starting with biomass heating (inadvertently cutting our remaining LPG gas supply in the process) and then reconfiguring the southern extensions. 20 years ago these were corrugated lean-tos and latterly a western porch, utility space and bathroom to the east. In order to make the Old Farmhouse entrance distinct it all had to move. 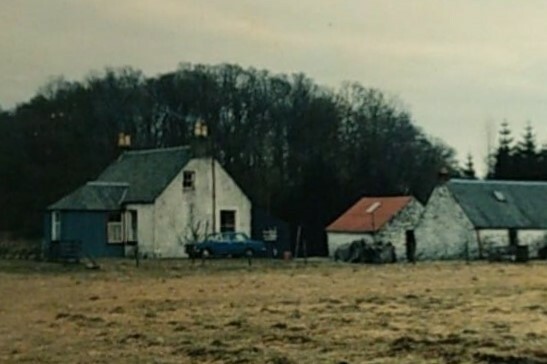 First the “pork shed” and store were demolished to expose the Eastern gable again and then new lintols, floor and insulation went in to meet modern building standards. Discovering a brick wall enabled a feature to be made in the kitchen and where possible the existing fittings were retained throughout. The slideshows and image comparisons below show where most of the work was targeted in the Southern reconfiguration. Squeezing in the upstairs bathroom was a challenge, but with some ingenuity and a skilled workforce at hand we moved doors, electrics and radiators, routed drainage and water and brought in new light. Other rooms mostly just required a lot of paint. Finally, a mention to all who have helped us; Jim on overall build, T on additional woodwork, Gus on electrics, Jamie on stone and slateworks, Stephen on lintols and stone, JTM (Jon, Nick, Welsh and many more) on plumbing, Kevin on tiling, Energy Source Dave and Mike for renewables and Charlie for manual labour. Architecture was master-planned by Alasdair at Studio Baird with building control through Claire at T Square with Jamie at J O Design for structural engineering. The Farmhouse will evolve again in the future, we hope this record of our short influence will provide interest and help to those who come after us.